Make your own room sign with the Finding Dory My Sign! Highlight your name in lights with your favorite characters from the Disney Pixar movie Finding Dory! 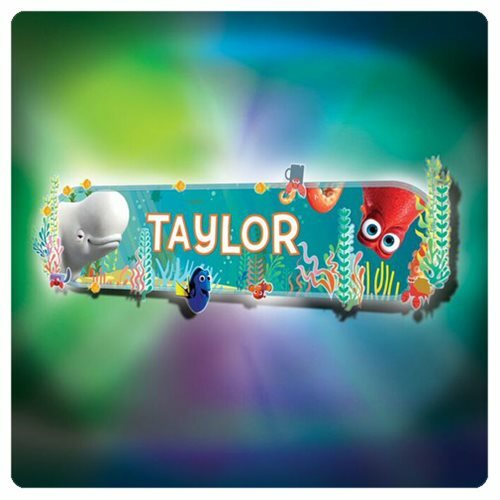 The Finding Dory My Sign helps you make your own personalized, light-up nameplate or sign, and customize it with decorative images and stickers from the Finding Dory movie. Display it on your wall and watch as a soft, multicolored light show creates a soothing room light. The Finding Dory My Sign is easy to display on your wall. Requires 3x "AA" batteries, not included. Ages 5 and up.